James Swann was born on a ranch near Merkel, Texas in 1905. While attending Sul Ross College in Alpine, Texas in 1923 he realized that he had artistic talent and began a career that would span for almost 60 years. While at Sul Ross he was influenced by Anna Keener and Elizabeth Keefer – both of whom were trained at the Art Institute of Chicago. Keefer was involved with the Chicago Society of Etchers and her work was selected for a number of CSE annual shows in the 1920’s and 1930’s. After graduation, Swann moved to Fort Worth for a position with the Southwestern Engraving Company. In 1927 he moved to Amarillo to be manager of the company’s office there. By 1931 he had completed his first etching – Lone Pine – Estes Park. In 1932 he moved to Dallas where he became involved with the art community in that city. His major supporter and teacher was Frank Klepper – a well known landscape painter. While in Dallas he completed a total of 31 etchings – most with a regional theme. In 1933 he visited Chicago to attend the Century of Progress World’s Fair. He, like many others of his time, was greatly influenced by the Fair and he decided that he would like to return to the city at some point to pursue his artistic career as an etcher. But he had many friends in Dallas and in February of 1935, he was elected secretary-treasurer of the newly formed Dallas Print and Drawing Collectors Society. Other founding members of the Society were Jerry Bywaters, Alexandre Hogue, Frank Klepper, Allie Tennant and Perry Nichols. This was the start of his long association with print societies as he later served in the same capacity for the Chicago Society of Etchers and the Prairie Print Makers. The Art Institute of Chicago Building was built to be a part of the Columbia Exposition Chicago World’s Fair of 1893. 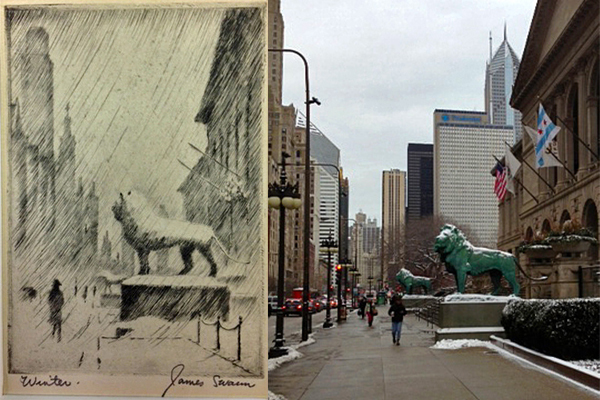 The famous lion statues were created by Edward Kerneys and also date from 1893. The Art Institute played an integral role in the development of etching in Chicago in the early 1900’s. The Chicago Society of Etchers had their annual juried show at the Institute every year from 1911 to 1931. Swann was an active member of the CSE for many years and served as its Secretary after Bertha Jaques retired. One of the reasons the Art Institute and the Chicago Society of Etchers parted ways was that the Society maintained a focus on representational art while the Art Institute was more interested in representing more modern art trends. 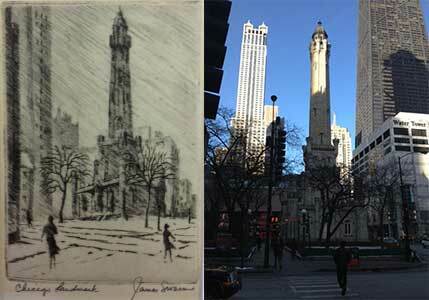 It is interesting to note that the Swann etching of the Art Institute is more impressionistic than representational. The mechanism of a wind-blown, snowy scene creates the mood and feeling of a cold wintry day. It almost makes you want to bundle up in your warmest coat. In 2015 when the picture on the right was taken temperatures in the City were in the high teens. The Chicago Water Tower was one of the few buildings left standing in this district of Chicago after the great fire of 1871. To many it represents the spirit of the City to persevere when faced with adversity. It is interesting to note that the above mentioned Columbia Exposition of 1893 was held in the city just a little over 20 years after the devastating fire. 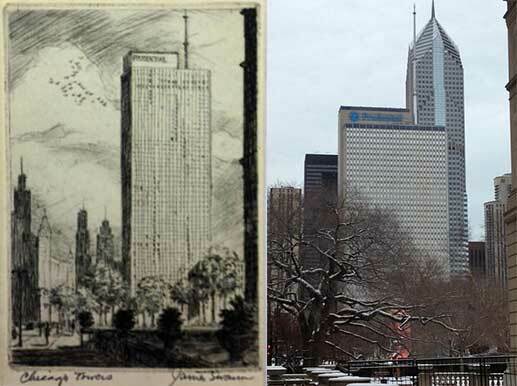 Again, Swann uses a snowy day to add to the impression of this “Chicago Landmark.” In the modern day water tower picture the structure is dwarfed by the skyscrapers in the background. Note: For more details on the life and work of James Swann see: James Swann: In Quest of a Printmaker with Presentation Prints of the Chicago Society of Etchers, Prairie Print Makers and the Woodcut Society by Joseph S. Czestochowski, Cedar Rapids Art Museum, 1990. Jimmie Swann was a family friend. I spent a number of afternoons in his Japanese garden while my parents, Jim (another Chicago artist) and Muriel Hvale, and Jimmie Swann visited. I loved reading your short biography. As a child, there were many things I did not know about him. I never had the pleasure of meeting Jimmie Swann. However, my father knew him for many years and spoke highly of him. It seems that wherever he went he had the ability to make friends – whether it was at Sul Ross, Dallas, Chicago or in the many places he visited around the world. He was an excellent artist, but he did as much or more by serving as the Secretary/Treasurer of both the Chicago Society of Etchers and the Prairie Print Makers and by representing many artists in the studio in his home. It must have been quite a place.